Father’s Day is this coming weekend and I thought it would be appropriate to post a recipe with some meat and grilling. Seasonal recipes chockfull of fresh vegetables are all nice and dandy, but sometimes you just need meat. I suppose it could’ve been even better if it was red meat, but we eat very little red meat at home. However, this particular recipe was made for my son’s birthday bbq and we did have burgers and hotdogs too that day. His birthday party was a couple of weeks ago, and he invited his little friends to play in the nearby park and enjoy a bbq. It rained…the entire time. But kids don’t care. They played in the rain, ate hot dogs, burgers and cake. The kids thoroughly enjoyed the cake and the food. I really enjoyed my two favourite things, these chicken kebabs and lemon rice. This should really be two separate posts but I wanted you to have the lemon rice recipe incase you make the chicken kebabs and want a side dish to go alongside. This lemon rice pairs perfectly with the chicken. It can be eaten at room temperature and so, makes an excellent dish for a bbq. The lemon rice is known as pulihora in India and can also be made with tamarind. It’s quite a popular dish originating from the south of India and is known under a couple of different names. As with any dish, there are different ways of making it with many different additions, but I usually keep the seasonings and additions quite simple letting the lemon be the star. The chicken kebabs are tandoori spiced but without the horrid red food colouring. I think they look far better with the vibrant, natural colour of the turmeric. The chicken will need a marinade but not an overnight one it only needs to be in the marinade for 6 hours, so plan accordingly. I have used chicken breasts, one fillet per person making about 2 skewers. If your chicken pieces are larger, you may get more. Chicken thighs can be used also. But, I’m happy to say, actually, I’m overjoyed to say, that these were incredibly moist, even when reheated the next day. Don’t over cook them on the grill. We started them on a hot grill (we used our gas this time) and let them sear all round. Then we pulled them off the hot side onto a low flame to finish cooking. You can baste with butter if you want, I just basted them when they came off the grill, but I have done it during grilling too at other times. If you’re afraid they are drying out, you can cover with a piece of foil to keep the moisture evaporating from the top. Just keep turning and feel the chicken with your fingers (without burning yourself) to see if the chicken is firming up. They will take about 15-20 minutes, maybe longer if your pieces are large. I made ours medium size, big enough to stay juicy but small enough to cook in a fairly short time. I also made sure to keep same size pieces together opting to place all the small pieces that come off the end of the breast on a couple of skewers by themselves. They were delicious! Perfectly cooked and incredibly juicy. I have to say, we never have success with juicy kebabs and this time we were thrilled to have them turn out so perfectly. We served them alongside the lemon rice and a red cabbage and pear slaw, which was pretty awesome too. Hope you think about treating Dad with this delicious meal. I’m sure he’ll enjoy it as much as we did. 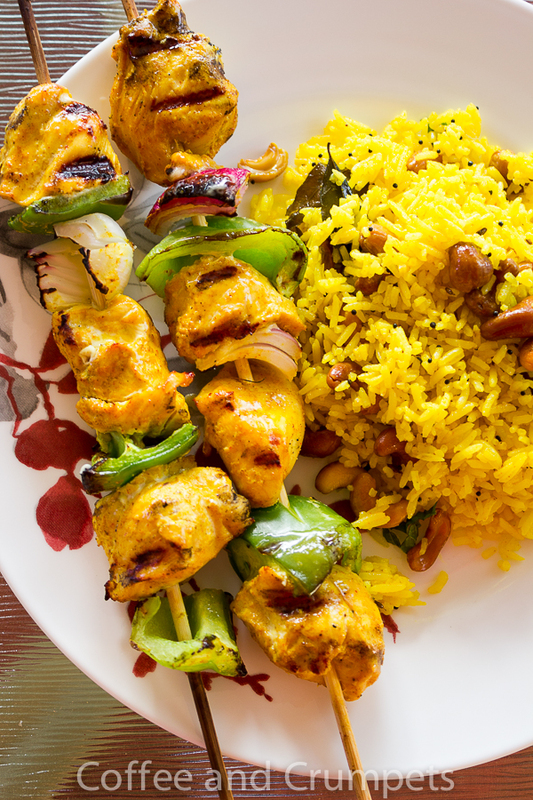 Moist and juicy tandoori chicken kebabs with tangy, lemon rice. Place the chicken cubes in a glass bowl. Add everything for the marinade: yoghurt, garlic, ginger, turmeric, cumin, garam masala, coriander, cayenne powder, lemon juice and heavy cream. Mix thoroughly with the chicken and refrigerate for at least 4 hours and up to 6. When ready to cook, salt the chicken. Thread the chicken onto the skewers alternating with the peppers and onions. I used about 5 pieces of chicken on a skewer. You may use less if your pieces are big or more if they are small. Don't leave too much space between them but don't pack too tightly either. Allowing them to touch will ensure a juicer kebab. Repeat until all the chicken is threaded. Heat your grill to 400-450 degrees. Drizzle the oil over the chicken kebabs and place the chicken kebabs on the hot part of the grill. Don't force the chicken off, when its ready, it will release and you can turn them around to sear all sides. Once the chicken is browned on all sides, move the chicken to a lower temperature and let it finish cooking. Use some foil to tent if the you feel the chicken is drying out, you can also baste with some melted butter. The chicken will take about 15-20 minutes for medium size pieces. Pull off the grill and serve hot. In a large fry pan or skillet, heat the oil on medium high heat and add the raw cashews. Fry till the cashews are golden brown. Pull the cashews out and put aside. To the hot oil, add the mustard seeds. Allow the seeds to begin popping, add the curry leaves and the split green chillies. Careful when adding the curry leaves, they splutter, have a lid handy to cover. Add the cold rice and start to mix thoroughly. Add the turmeric and ground cumin. Fry the rice until hot and mixed through with the spices. Add the lemon juice and check for salt. Adjust lemon juice and salt to taste. I like lots of lemon in my rice so I use a lot. Cook a minute longer and pull off the heat. Add half of the cashews and mix through. Sprinkle the rest on the top before serving along with some chopped mint or cilantro. I’d like to take this opportunity to wish all the wonderful fathers, fathers in laws, step fathers and grand fathers a very happy Father’s Day. May you enjoy a special day surrounded by your loved ones. I can imagine how fragrant it must be that day you were cooking this! It’s mouthwatering. These look WONDERFUL – they remind me of Persian Jujeh Kabob. And I love the yellow color of turmeric. Delish. Beautiful meal Nazneen. And I really hadn’t thought about red food coloring being in tandoori seasoning. AND, I still haven’t made it over to the Indian market to replenish my curry leaves. Pinning this one to try soon. And please, yes, put up the spiderman cake!! Oh this beautiful, vibrant colors! Makes my mouth water just by looking at the pictures. Lovely recipe, dear Nazneen, perfect for Father’s Day. I’m so glad you posted the rice together with the chicken because I will make them both together when I get home from vacation. They both sound wonderful! Your way of BBQ’ing chicken is the way if you want tender chicken. Can you recommend an alternative to curry leaves? I bet this dish smells as good as it looks. And tastes as good as it looks and smells! Wonderful job on the cake, too! Love the pictures with the red cabbage — its color works so well with the yellow rice. These are two great recipes, each with a lot of flavor. Definitely the kind of food I like. But we do need that cake recipe! 😉 Really nice post — thanks. My grill is fired up several times a week this time of year. These kabobs look like the perfect thing from my Weber. Love the lemon rice! Great post! I recently attended an Indian cooking class and they made chicken tandoori then proceeded to pour in an entire little jar of red food colouring. I wondered why oh why would you do that?!!! I too much prefer the rustic and natural colour of cooked chicken with the regular tandoori flavors. Great recipe! ! There’s so much to love about this post, Nazneen. First off,. I love chicken with lemon, whether it flavors the chicken or a pasta side dish, a chicken and lemon combo is a sure winner. Now, I’ve not make a lemon-rice dish and it sounds really good. Love the color and I’d serve it in the winter just to bring a little bit of sunshine to the table. On a cold overcast evening, something bright on the plate is a good thing. And you know how I feel about that cake.Fantastic! I don’t care how many “hits’ it gets, please show us how you did it. That was a masterpiece! The whole meal sounds and looks delicious, Nazneen! I hereby pronounce this as my Sunday lunch. And that cake, on my god! it looks beautiful for a birthday boy. I must say you are an amazing cook and baker. Believe me Nancy, I do not have the patience. I may have a bit of talent, but I surely don’t have patience and that’s why I just don’t focus on cakes like this. There is big business in this if you choose to do it, it would drive me crazy! We’ve all done the spice mix, I finally put a stop to it! It’s pretty easy. You are a clever one Nazneen, creating fabulous food, mouthwatering and nutritious at the same time. A big piece of that cake won’t hurt at all. Love the look of the kababs. A big piece of that cake didn’t hurt at all, until I tried on my pants…. Thanks Charlie. I know, I’ve been reading your Sunshine Coast posts and it’s unfortunate the sun wasn’t out for you. Alfie enjoyed himself at least. The cake was wonderful, thanks for the recipe! And try the rice, it’s wonderful! Love all of it…the kebabs, the rice but you know me…most of all the cake:-) The little ones would have had a blast. Happy Belated Birthday to your son. Your site is going to be hit with ‘spiderman’ searches:-) As usual, my mouth is watering at the sight of those kebabs and I showed it to my Mother (who is here at the moment) and asked her to make it. Yummm! Thank you, Monica! Kids, they don’t mind at all. They ran around like crazy and then it got cold and they were all shivering because they were wet and cold! The kebabs and this rice is my new fave combo! I hope you try it. This looks so flavorful and aromatic. Yum! Oh wow you’re cake is awesome. It’s great how kids don’t mind the rain, I’d be straight out of it ha! The lemon rices looks so good, I love how vibrant it is! Will have to try this! Thanks Holly! They were soaking wet and then the temps fell and it got chilly, then they were all siting in the shelter shivering. I had to get them around the grill to warm them up! Kids. The rice is wonderful, hope you try it. Another glorious dish! I love chicken kebabs as you well know! Can’t wait to try these with the lemon rice. This is a perfect dish for anyone! I may even try a version of this marinade with salmon! And hope you have fun watching on Saturday! My guess is that I will be on yard detail! Oh, I think you’ll like the lemon rice. It’s pretty tasty. As for the cake, you should totally make it for yourself! Have a great time in Burma! Mark, who NEVER discusses food before noon, said – “Wow, this looks really good!” at 5:30am today. SO guess what we will behaving soon? I am especially excited to try the rice – I need to get some curry leaves soon! I’m so glad it had Mark talking so early in the morning! The rice is wonderful and it’s one of my favourites. Great use for leftover rice. I hope you like it as much as I do! Nazneen, this looks like a perfect meal! I love all of the spices and yogurt marinated chicken is always so moist and delicious! Thanks for a really great recipe! Thank you, Donalyn! The kebabs were great and the rice is one of my favourites. I hope you try it! What a wonderful birthday meal. That cake is so cute. No wonder the children didn’t mind playing in the rain with this lovely food to fortify them. Thanks Karen! They ate hamburgers, I ate these 🙂 I needed them after days of decorating the cake! What a great meal! That lemon rice is a must make for me. You did an awesome job creating that birthday cake..very cool! Thank you so much, Angie! I was happy with the way it turned out. I would run around in the rain if I could get a piece of that cake afterwards – your spiderman cake looks wonderful! So superbly made – I sure hope you post the recipe and process! Now, about these kebabs – that marinade sounds so aromatic – wow! Love the lemon rice too with its beautiful coloring from the turmeric! Shashi @ RunninSrilankan recently posted..Mushroom Shepherd’s Pie! Yeah, the kids were excited to have the cake! It turned out well inside too! The kebabs were my fave though, and I love lemon rice with so many things. Nazneen: I think any father in the world would love to have this plate of goodness with chicken kebab skewers and lemon rice. Your son’s birthday cake looks fun and pretty. I am sure he had a great time! I am so excited for the world cup. Abdullah keeps asking if he can play in it… lol. This recipe is fantastic. We are going camping Saturday, so I think we’ll cook them Friday and reheat at the campground. I have real issues cooking over a campfire or our little portable grill. Now we have gas I’m spoiled. I love my gas grill! (: Happy bday to Laith and Father’s day to Trace. We are so lucky to have good dads and married to good dads. Alhum. Thanks Mariyam. Hope it’s good weather for you on Saturday for camping. No telling these days. I’ll be in Fort Collins Sat morning, hopefully it doesn’t rain. 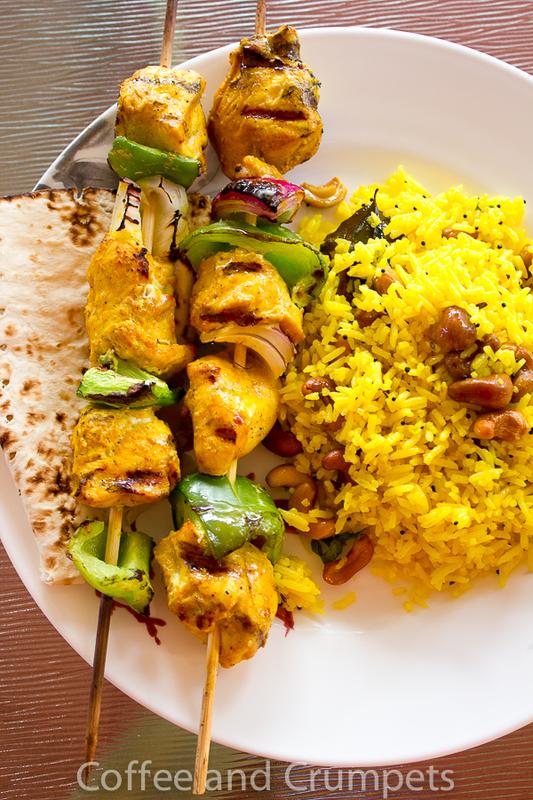 Dear Nazneen, I can see from this lovely post that you seem to be feeling a bit better these days – your recipe does look just wonderful, love those kebabs and the colorful lemon rice. Of course, I love everything lemon, so I should really give this recipe a try, really cannot get over all the colors your dish has.The burgundy-colored slaw adds such a nice, bright additional element to this dish. And although I already wrote to you about the birthday cake for your son, I shall do it again: it is amazing, you are one talented lady, dear friend! Thank you, my dearest Andrea! I am getting better by the minute. I am back on my meds and they will take some time and I need physical therapy but I’m able to move better at least. I am taking care of myself 🙂 trying to anyway. Thank you my dear, and good luck to Germany 🙂 They will probably get further than England.